The ESRD Prospective Payment System introduced two incentives to increase home dialysis use: bundling injectable medications into a single payment for treatment and paying for home dialysis training. We evaluated the effects of the ESRD Prospective Payment System on home dialysis use by patients starting dialysis in the United States from January 1, 2006 to August 31, 2013. We analyzed data on dialysis modality, insurance type, and comorbidities from the United States Renal Data System. We estimated the effect of the policy on home dialysis use with multivariable logistic regression and compared the effect on Medicare Parts A/B beneficiaries with the effect on patients with other types of insurance. 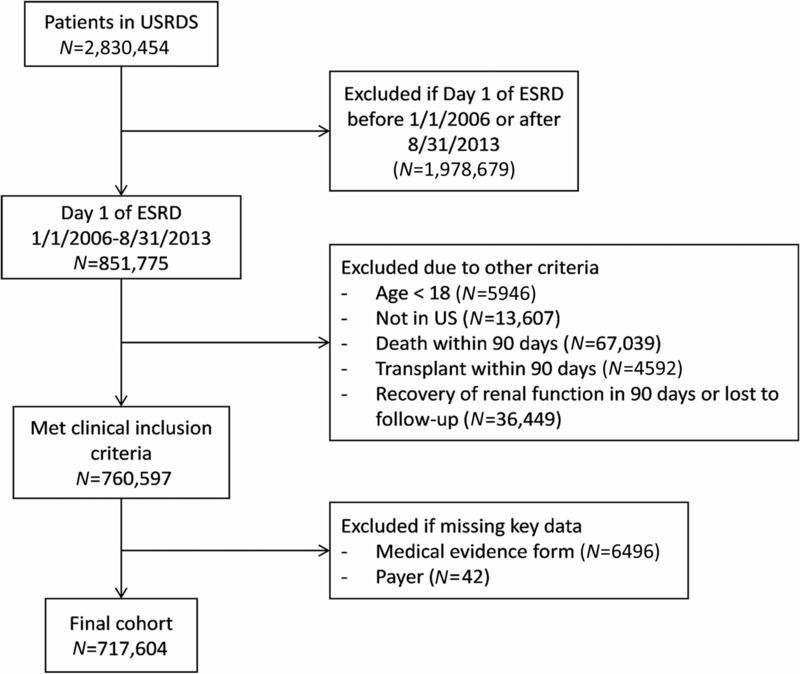 The ESRD Prospective Payment System associated with a 5.0% (95% confidence interval [95% CI], 4.0% to 6.0%) increase in home dialysis use by the end of the study period. Home dialysis use increased by 5.8% (95% CI, 4.3% to 6.9%) among Medicare beneficiaries and 4.1% (95% CI, 2.3% to 5.4%) among patients covered by other forms of health insurance. The difference between these groups was not statistically significant (1.8%; 95% CI, −0.2% to 3.8%). Conversely, in both populations, the training add-on did not associate with increases in home dialysis use beyond the effect of the policy. The ESRD Prospective Payment System bundling, but not the training add-on, associated with substantial increases in home dialysis, which were identical for both Medicare and non-Medicare patients. These spill-over effects suggest that major payment changes in Medicare can affect all patients with ESRD. Although some studies have attributed an increase in home dialysis use to the PPS,4,9–12 others have questioned its overall effect.11,13 None have accounted for preexisting trends or attempted to disentangle the effects of the training add-on from the main PPS. In this study, we took advantage of the 2.5-year delay between the PPS’s announcement and the inclusion of the training add-on to investigate the incremental effects of both on dialysis practice in the United States. Additionally, the policy’s effect on different insurance groups has not been studied. 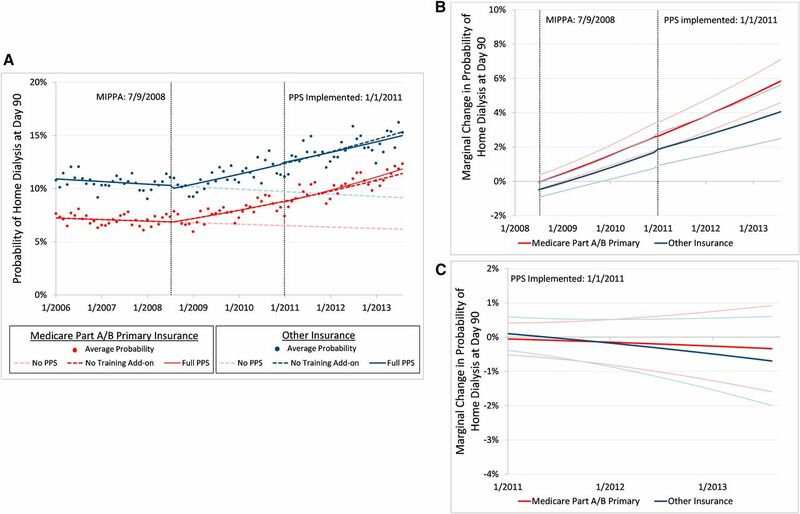 The PPS changed reimbursement for beneficiaries of Medicare Parts A and B (the hospital and physician reimbursement arms of Medicare), yet up to 40% of patients starting dialysis do not receive Medicare Parts A and B as their primary insurer even after 90 days of starting dialysis.14,15 We aimed to determine whether the PPS’s effects “spilled over” onto patients without Medicare Parts A and B. Of 851,775 patients who had their first day of dialysis in our study period, we excluded 134,171. The final population consisted of 717,604 patients: 231,972 who initiated dialysis in the pre-PPS era, 231,958 who initiated dialysis after the MIPPA but before implementation of the PPS, and 253,674 who initiated dialysis after the PPS was implemented (Figure 1, Table 1). Assembly of the study cohort from the USRDS. Table 1 illustrates the baseline characteristics of our study population, stratified by start of dialysis relative to the PPS. In all three periods, patients had roughly equal distributions of sociodemographic and clinical characteristics, with similar comorbidities and laboratories across the three time periods. Notably, patients starting after the PPS were more likely to have a lower starting hemoglobin level. We found that being older, male, black, or Native American was associated with lower likelihoods of home dialysis at day 90 (Table 2). Patients living in more affluent and rural areas were more likely to use home dialysis. In general, patients with comorbidities were less likely to use home dialysis (odds ratio point estimates, from 0.72 to 0.94). A notable exception was hypertension, which was associated with a higher likelihood of home dialysis (odds ratio, 1.08; 95% confidence interval [95% CI], 1.06 to 1.12). Nonambulatory status, living in a facility, and having no prior nephrology care were also associated with low home dialysis use. We also found that unemployed and retired patients were less likely to use home dialysis (odds ratio point estimates, 0.42–0.56). We observed steady decreases in home dialysis use before the MIPPA in both the Medicare Parts A/B and other insurance subgroups (Figure 2A, see Supplemental Figures 1 and 2 for aggregate results). Both subgroups saw a reversal of this trend after the MIPPA’s passage (Figure 2A). We projected that in the absence of the PPS, 7.6% (95% CI, 6.4% to 8.8%) of the Medicare Parts A/B population would have used home dialysis by the end of the study period. In contrast, with the PPS, the proportion using home modalities increased to 13.4% (95% CI, 13.1% to 13.8%). Similarly, in the non-Medicare subgroup, we projected that home dialysis use would have declined to 9.2% (95% CI, 7.7% to 10.8%) in the absence of the PPS; in the PPS era, we observed an increase of home dialysis use to 13.3% (95% CI, 13.0% to 13.7%) of non-Medicare patients by the end of the study period. Overall, the PPS was associated with a 5.0% (95% CI, 4.0% to 6.0%) increase in home dialysis use by the end of the study period (Supplemental Figure S2B). Effect of the PPS on home dialysis use at day 90 stratified by type of insurance, Medicare Parts A/B (red) or other insurance (blue). (A) Depicts the unadjusted probability of home dialysis at day 90 over time for each of the populations. The scatter plot gives the average proportion of the population using home dialysis at day 90. In both populations, the predicted probability of home dialysis under the PPS (solid red and solid blue lines) increased substantially after passage of the MIPPA. We projected a similar increase in home dialysis use if the PPS had taken effect without the training add-on (dark dotted red and blue lines) and an overall decline in home dialysis without the PPS (light dotted red and blue lines). In (B), we show the association between the PPS and change in provider behavior in the Medicare Part A/B and the other insurance populations (dark red and blue lines respectively) with 95% CIs (light red and blue lines). The graph shows the difference between observed home dialysis use under the PPS and projected home dialysis use in the absence of the PPS, which represents the estimated change in provider behavior over time. The MIPPA was not associated with an immediate change in provider behavior, represented by the null effect in July 2008. However, the change in home dialysis use steadily increased afterward and continued after the PPS’s implementation. By the end of the study period, this difference in provider behavior resulted in an absolute increase in home dialysis use by 5.8% (95% CI, 4.3% to 6.9%) in the Medicare Parts A/B population and 4.1% (95% CI, 2.3% to 5.4%) in the non-Medicare subgroup. Although the PPS had a slightly higher effect in the Medicare Part A/B population relative to the non-Medicare population (difference of 1.8%), it was not statistically significant (P=0.08). (C) Shows the association between the training add-on component of the PPS and the nonsignificant change in provider behavior in both populations (dark red and blue lines) with 95% CIs (light red and blue lines). The graph shows the difference between observed home dialysis use under the full PPS and projected home dialysis use in the absence of the training add-on. We found that this difference was not statistically different from null during the entire study period. The PPS was also associated with incremental changes in provider behavior over time, which we estimated as the difference between observed home dialysis rates under the PPS and predicted home dialysis rates in the absence of the PPS (Figure 2B). Immediately after the MIPPA’s passage, this difference was not significant. However, the difference between actual post-PPS rates and predicted (absent-PPS) rates steadily grew over time, signifying a gradual and cumulative change in provider behavior associated with the PPS. By the end of the study period, this difference in provider behavior resulted in an absolute increase in home dialysis use by 5.8% (95% CI, 4.3% to 6.9%) in the Medicare Parts A/B population and 4.1% (95% CI, 2.3% to 5.4%) in the non-Medicare subgroup. We estimated an average increase of 2.7% (95% CI, 1.8% to 3.4%) in the Medicare Parts A/B population and 1.8% (95% CI, 0.8% to 2.6%) in the non-Medicare population (Table 3). Conversely, the training add-on was associated with a nonsignificant effect on provider behavior in the two subgroups (Figure 2C). Although home dialysis use continued to grow under the training add-on, it was not associated with any increases beyond what was predicted under the main PPS. We estimated a change in home dialysis use by −0.3% (95% CI, −1.6% to 0.9%) in the Medicare Parts A/B population and −0.7% (95% CI, −2.0% to 0.6%) in the non-Medicare population. When comparing the effect of the PPS on the two subpopulations, we found that they were not statistically different (Table 3); the difference in effect between the populations was 1.8% (95% CI, −0.2% to 3.8%) in the last month and 1.0% (95% CI, −0.2% to 2.1%) over the entire post-PPS period. In sensitivity analysis, we similarly found that patients with Medicare Advantage had nearly identical increases in home dialysis use as patients with Medicare Parts A and B (data not shown). Our analyses show that the PPS was associated with a large increase in home dialysis use among patients starting dialysis in the United States. We observed that the PPS was associated with a gradual and cumulative change in provider behavior with steady increases in home dialysis over time. We found statistically similar increases in home dialysis use in the incident Medicare Parts A and B population and the non-Medicare population, indicating significant spill-over effects onto patients without Medicare Parts A and B. Conversely, the home dialysis training add-on was not associated with additional increases in home dialysis use in either population. On the other hand, the payment for home dialysis training was not associated with an increase in home dialysis use. One possibility for the observed null effect is that the add-on payment was not sufficient, and that a larger payment would have yielded the desired change. Notably, CMS increased the amount of the training add-on by 50% in 2014 and an additional 91% for the current clinical year (2017).9,37 A second possibility is that incentives for home dialysis have diminishing returns and that the MIPPA already catalyzed a large shift in home dialysis use in the United States. Modest incentives such as the training add-on may not exert significant changes in home dialysis use, particularly if observable increases in home dialysis use start to plateau. Although we did not observe any evidence of diminishing increases in home dialysis use in our study, this may pose a challenge to future increases in the training add-on. Even if the increased training payment succeeds in recruiting more patients to home dialysis, the increase may be mitigated by higher levels of drop-out in prevalent patients, particularly given the high rates of burn-out from home dialysis.38–42 Future studies should investigate the effect of the more generous training add-on and the trade-off between increased recruitment and drop-out. Our study has some important limitations. First, because of the small number of patients on home hemodialysis, we chose not to separate peritoneal dialysis from home hemodialysis outcomes, and our results are likely driven by trends in peritoneal dialysis. Second, because of the retrospective nature of the study and because Medicare implemented the PPS nationwide at a single time point, we cannot definitively conclude that the increase in home dialysis was causally related to the PPS. The FDA’s label change for erythropoietin and the influx of educational initiatives spearheaded by the nephrology community occurred around the time of the MIPPA, and it would be difficult for any retrospective study to disentangle effects attributable to each. It is likely that these interventions synergistically led to the dramatic rise in home dialysis use. Of note, without the PPS, erythropoietin would have still remained the most profitable part of in-center hemodialysis, financially mitigating any incentive to switch to home modalities. To our knowledge, no other significant dialysis-related policy, reimbursement change, practice guideline change, or technical innovation occurred around this time period. Third, because of the study’s observational nature, our results may be confounded by unobserved characteristics. We attempted to circumvent this limitation by incorporating time trends through a segmented regression design. Because eligibility for Medicare did not change during our study period, each cohort temporally acted as its own control, reducing the likelihood of bias. We also found that the sociodemographic and clinical characteristics of the populations at each time point were similar, making residual confounding less likely. Lastly, several covariates had a high rate of missing values, particularly hemoglobin and albumin levels. We found that our results were robust to sensitivity analyses in handling these missing data. In summary, the PPS was associated with a relatively large increase in home dialysis enrollment, reversing the previous decade-long decline. This increase was shared among patients with and without Medicare Parts A and B and constitutes a major policy success. Conversely, the training add-on payment was not associated with any meaningful change. Programs similar to the ESRD PPS could enhance value in health care delivery to patients with other disease states (e.g., heart failure, chronic obstructive pulmonary disease, peripheral arterial disease) common among Medicare beneficiaries. The study was approved by the Stanford Institutional Review Board. Patient-level data came from the United States Renal Data System (USRDS),43 a data registry jointly sponsored by the National Institutes of Health and CMS that houses extensive data on virtually all patients with ESRD in the United States. We supplemented the USRDS with the 2012 American Community Survey (ACS) and the 2000 Census. We included patients whose first day of dialysis fell between January 1, 2006 and August 31, 2013, so we could incorporate trends before and after the PPS. Although we had data through the end of 2013, we excluded patients who started dialysis after September 1, 2013 because we studied the choice of dialysis modality at 90 days of dialysis. We also excluded patients who spent their first 90 days dialyzing outside the United States, were younger than 18 years old, had a prior kidney transplant, were missing from the payer database, or had a missing Medical Evidence Form (CMS form 2728). Finally, we excluded patients who died, recovered kidney function, or received a kidney transplant within 90 days of starting dialysis. Many patients with newly diagnosed ESRD require urgent initiation of dialysis and are temporarily assigned to in-center hemodialysis. Because some transition to home-based therapies over time, we chose dialysis modality at 90 days as the outcome. This also allowed us to study any effects exerted by dialysis providers during the first 90 days of dialysis. We divided the cohort into three mutually exclusive groups on the basis of the patient’s first day of dialysis: (1) before passage of the MIPPA (January 1, 2006 through July 8, 2008), (2) between the MIPPA and implementation of the PPS (July 9, 2008 through December 31, 2010), and (3) after implementation of the PPS (January 1, 2011 through August 31, 2013). In contrast, even though the home dialysis training payment was announced in 2010, this additional incentive only applied to incident patients and did not materialize for dialysis providers until the PPS was fully implemented in 2011. Therefore, we chose the implementation date of the PPS as the cutoff to evaluate the effects of the training add-on. We compared patients who had Medicare Parts A and B with those who had other insurance. We determined each patient’s primary insurer at day 90 of dialysis using the payer database in the USRDS. We chose primary insurance at day 90 instead of day 1 to ensure that the in-center hemodialysis and home dialysis subpopulations were comparable: Medicare does not activate until day 90 for in-center patients,14 whereas Medicare activates on day one for home dialysis patients. In a sensitivity analysis, we compared patients who had Medicare as primary insurance (including Medicare Advantage or Part C) to those without Medicare. We omitted facility-level characteristics because a patient’s choice of dialysis facility is heavily influenced by, and often downstream of, the patient’s choice of dialysis modality. Including these characteristics as covariates would introduce bias because they are affected by our outcome of interest. Because many patient characteristics are not monotonically associated with patient outcomes, we converted all continuous variables into categoric variables. Cutoffs were chosen using clinical judgment and to ensure that a sufficient number of patients were binned in each category. Some variables had implausible outliers, which we assigned to missing (Supplemental Table 1). We used multiple imputation to handle missing data. We computed descriptive statistics for our three subgroups: pre-PPS announcement, pre-PPS implementation, and post-PPS implementation. To estimate the treatment effect of the PPS and primary insurance type on the initial choice of dialysis modality, we employed a segmented regression design.46,47 Because our outcome was binary, we used a multivariable logistic regression with robust SEMs. Our model specified a continuous covariate for time, a categoric covariate for dialysis start relative to the PPS, a categoric covariate for primary insurance at day 90, and interaction terms among the three variables (see Supplemental Appendix 1, Supplemental Figure 1 for technical specifications). By including a continuous covariate for time, we were able to estimate incremental changes over time. We incorporated covariates for seasonality to control for autocorrelation and adjusted for the above specified confounders. For each insurance subgroup, we estimated the average predicted probability of choosing home dialysis at each month during the study period. We also calculated the counterfactual predicted probability assuming that (1) the PPS had never taken effect and (2) the PPS was implemented without the home dialysis training add-on. To estimate the monthly effect of the PPS with and without the training add-on, we took the difference between the actual and the counterfactual probabilities. This difference can also be interpreted as the estimated change in provider behavior associated with the policy at any given point in time. Additionally, we determined the average increase of home dialysis in the post-PPS period by integrating the PPS’ effect curve over time and dividing by the time interval. We then compared the effect size in each group. SEMs and 95% CIs were estimated using the δ method and nonparametric bootstrap (1000 samples). Although the majority of covariates did not have any missing data, the following variables had missing values: census characteristics (2% missing), body mass index (1%), albumin (25%), and hemoglobin (10%). We used multiple imputation by chained equations, and we employed a multinomial logistic regression model with the augmented-regression approach suggested by White et al. to avoid bias from perfect prediction of categoric variables.48–50 Because albumin and hemoglobin values had high rates of missing data, we used twenty imputations. In a sensitivity analysis, we performed a complete case analysis, and all results were robust to this change. Statistical analyses and data manipulation were performed with STATA, version 14.1 (StataCorp). This work was supported by the National Institute of Diabetes and Digestive and Kidney Diseases (NIDDK) of the National Institutes of Health (NIH). E.L. is supported by NIDDK F32DK107123. G.M.C. was supported by NIDDK K24 DK085466. The content is solely the responsibility of the authors and does not necessarily represent the official views of the NIH. The data reported here have been supplied by the United States Renal Data System. The interpretation and reporting of these data are the responsibility of the authors and in no way should be seen as an official policy or interpretation of the United States government. This article contains supplemental material online at http://jasn.asnjournals.org/lookup/suppl/doi:10.1681/ASN.2017010041/-/DCSupplemental.